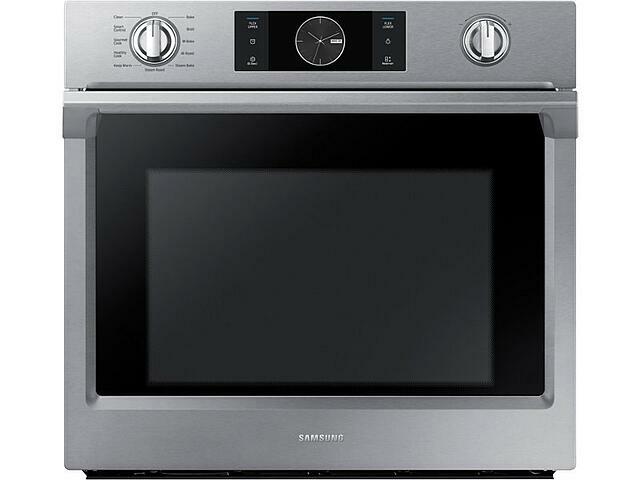 I recently had the opportunity to cook in the new Samsung wall oven with steam cooking technology. Samsung’s most recent model does an excellent job at delivering you many beneficial features for less money than other premium brands like Jenn-Air, Wolf, and Miele. This oven is equipped with Steam Cooking Technology (Steam Bake and Steam Roast), Healthy Cook, Gourmet Cook, Smart Control, and Flex Duo™…..Not your traditional wall oven features! Steam Bake and Steam Roast have temperature ranges of 230°F - 550°F and a recommendation chart of foods to cook with steam. Judging by the temperatures, this cannot be a true steam oven, but it does provide you with a “window of steam opportunity,” or at best, a nice humid environment. The oven gives you the option of steam output amount measuring in Low, Medium or High, however, the ambiguity of this option makes it impossible to know just how much steam is being injected into the oven cavity. After using the oven, it is certainly not enough to produce a buildup of condensation inside the oven, just a light humidity. Healthy Cook offers 6 specialized cooking options, but it is unclear what exactly is happening inside the oven, which elements are being used, or whether there is an application of steam. The only information given is temperature. On a similar note, Gourmet Cook offers 10 pre-programmed auto cook options with beautiful full-color moving pictures to advertise the chosen food item. Contrary to what Samsung leads you to believe (oven manual states that you can download detailed recipes from the Samsung website), I have yet to find any detailed recipes anywhere for any of the featured Gourmet Cook foods. Assuming you know how to prepare these items, Gourmet Cook just provides the time and nothing more. The premium brands, especially Jenn-Air, offer time, temperature, and cooking results, so they are more robust. 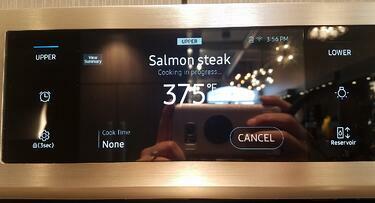 Smart Control is Samsung’s answer to Wi-Fi connectivity in a wall oven. Once Samsung’s Smart Home app is downloaded into a mobile device, you have the ability to: start the oven; change settings; change cook time and temp; and turn the oven off all from their mobile device. Not a bad deal when you are relaxing on the couch, waiting for your Sunday roast to cook! Jenn-Air is Wi-Fi enabled as well with similar functions. Their new oven will also respond to Amazon's Alexa. The Flex Duo™ feature is a bit limiting because it only allows you to use the ovens up to 100 degrees apart in temperature. If you want to roast at 450°F in the upper compartment, you are limited to a 350°- 480°F temperature range in the bottom compartment and nothing lower. 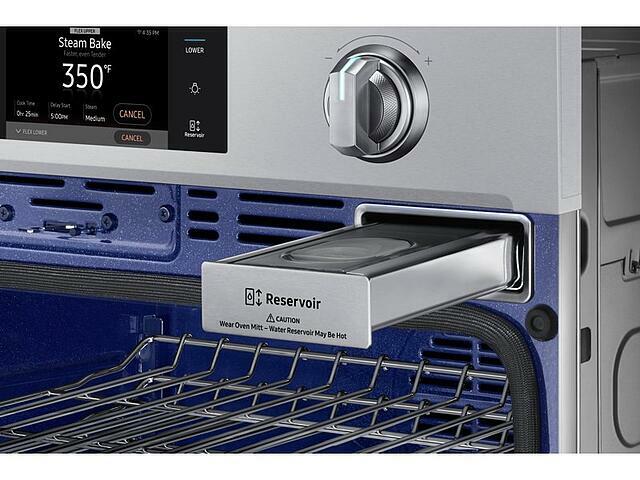 This feature is a nice addition but not a true oven, considering the fact that the lower compartment also cannot broil. 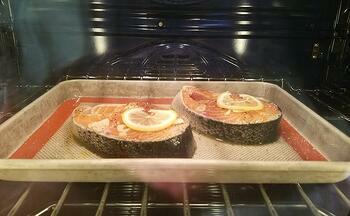 Chef Saba, from the Dorchester showroom, and I decided to put this oven to the test. 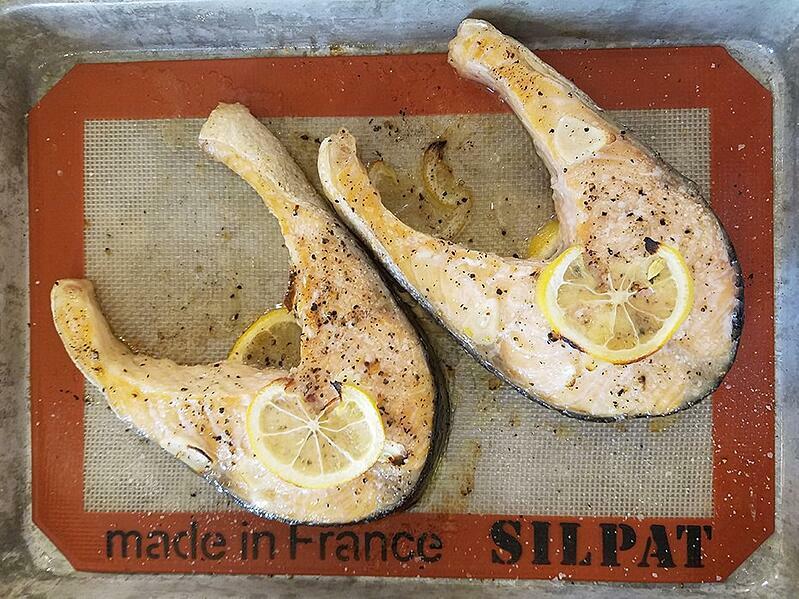 We made the Salmon Steaks under Healthy Cook and the Lasagna and Roasted Lemon Chicken Thighs under the Gourmet Cook settings. 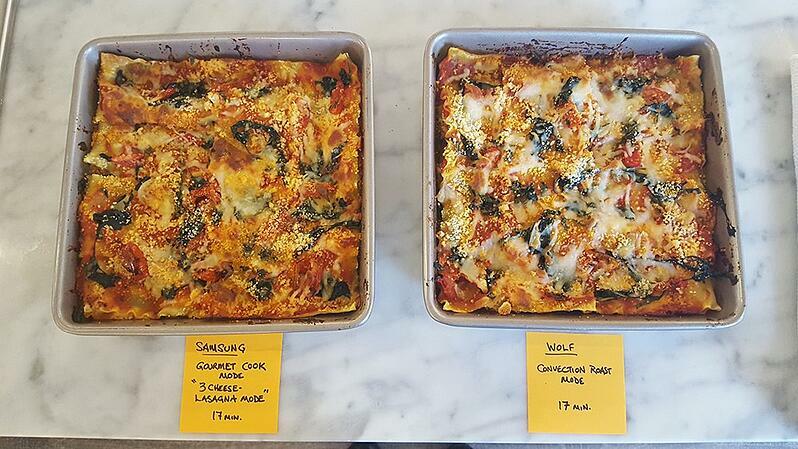 The salmon setting used a preset temp but we had to select a time frame, whereas the lasagna and chicken both were given a preset time but no temps or modes were given. All three food items were well cooked but still retained enough moisture on the inside and crisp texture on the outside. We also tested the Steam Bake setting with the steam output set at ‘High’ using small brioche rolls which baked to perfection in the Samsung oven. 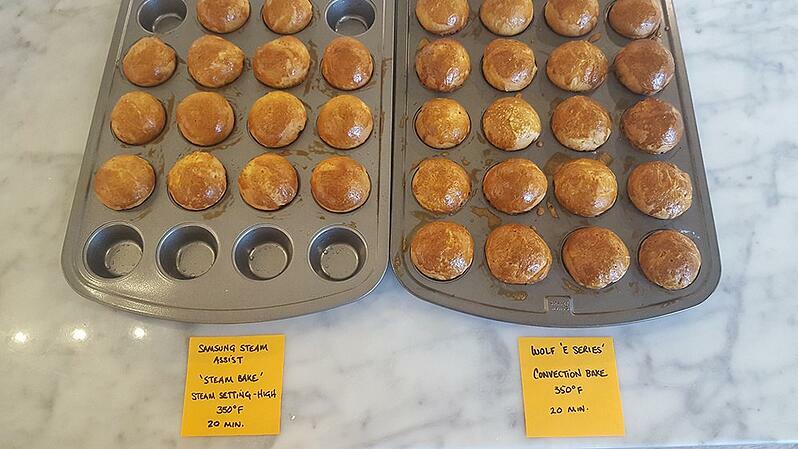 As a true test, we also baked the same rolls in another convection oven with no application of steam. There was a noticeable difference in the texture and color of the rolls; so, Samsung won here. As for pros and cons, I think this oven has many strong features with a few drawbacks: Dual convection is always great to have, providing a superior convection system with optimum airflow, but most brands have that feature. I will mention Flex Duo™ again as a drawback because even as a benefit, I still feel like it’s somewhat limiting and could be improved upon. My inability to locate the recipes that supposedly coincide with the Gourmet Cook setting is also a bit of a disappointment. The water reservoir is constructed of metal; not the best material to handle while the oven is in use given that the reservoir is located inside the oven at the top. You have to use an oven mitt to handle the metal reservoir. In conclusion, this is the perfect oven for those who want the best of both worlds - an electric heat for great baking results and the option to impart steam, assimilating the characteristics of a gas oven to offer the perfect amount of humidity for roasting. Depending on how you cook, this is a very functional wall oven that you can't go wrong with. Editor's note: As appliances are becoming more technical and smart, you will be able to bake better with new modes like steam or speed. Our chefs cook 5 days a week so you can utilize your new appliances to their full potential after your purchase. We also have cooking demos on the weekends so you can "try before you buy." This article was written by Nicole, our chef in Framingham. 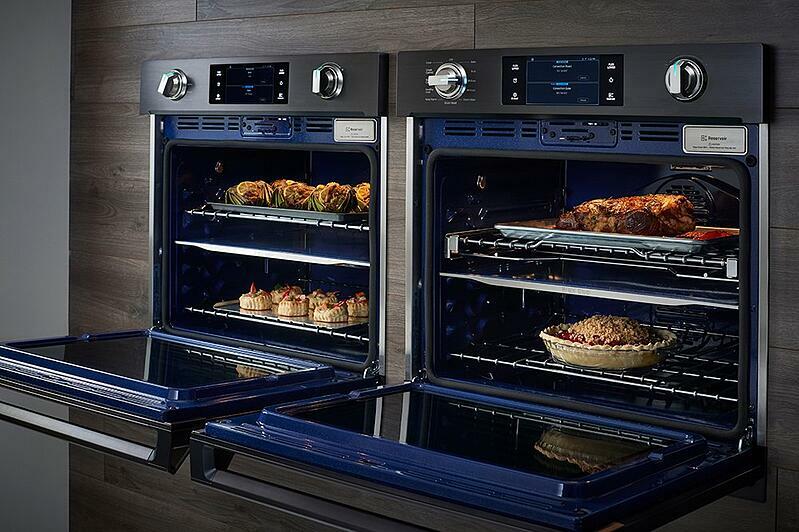 Interested in learning more about wall ovens? Get the Yale Wall Oven's Buying Guide with updated features, specs, and detailed profiles of the best brands like Miele, Wolf, Bosch, Thermador, and more. Over 250,000 people have read a Yale Guide. Nicole Parmenter is our resident Chef at Yale Appliance + Lighting; she has multiple culinary degrees and is an appliance expert. Chef Nicole can teach you how to use your new appliances and give you tips, recipes and honest opinions on products.